How can educators best understand the impact that Internet technologies are having on today’s youth and use that understanding to inform their teaching practices? 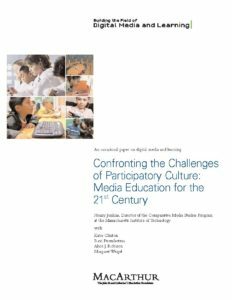 In his report Confronting the Challenges of Participatory Culture: Media Education for the 21st Century (PDF), funded by the John D. and Katherine T. MacArthur Foundation’s digital media and learning initiative, author Henry Jenkins identifies an Internet culture of participation that defines the lives of youth today. Negotiation—the ability to travel across diverse communities, discerning and respecting multiple perspectives, and grasping and following alternative norms.